Was woven by the hands of poor women . . .
His gifts are surely wasted! Like any city, Beijing can be a story of contrasts, especially in terms of rich and poor. This should not be surprising to us and the same could be pointed out in New York, London, Paris, and just about anywhere. So what I write here should not be taken as a criticism. In fact, I think Beijing is doing well in addressing disparities in income and living conditions given the rapidity of its development in recent years. I don’t really think we in America are in a place to point fingers given our tremendous wealth and the amount of poverty and injustice in our country. So this is just an observation. This morning we went to the huge, new building housing the Beijing Olympic Organizing Committee and heard a presentation about preparations for the 2008 Olympic Games in Beijing. After hearing and seeing all the evidence of these preparations, I can guarantee you that the world will be blown away by the Beijing Olympics. We have seen various Olympic sites from our bus and they are very impressive and either already finished or near-finished. 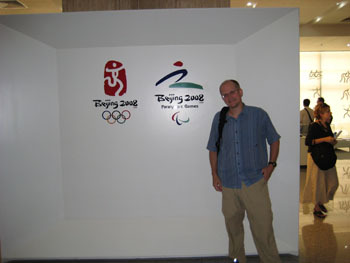 The preparations have been pain-staking and thorough and the community spirit evidenced in Beijing for the Olympics is palpable already. Billboards, countdown signs, banners, merchandise, etc. are omnipresent here. It is hard to go anywhere and not find an opportunity to buy an Olympic shirt or hat. I think we all will be impressed next summer. Then, this afternoon we went outside of Beijing center to the outlying part of the city. This area is filled with the factories and the laborers that sustain Beijing’s economy and are helping prepare the city for the Olympics. This area is the home of hundreds of thousands (or more) of migrant workers who have come to Beijing seeking employment. This is a tale that can be found in many cities in coastal China. Of course, life is very difficult for the migrants and their children face an enormous problem obtaining education. Because they are migrants, the do not automatically receive the public education given to official residents and must either pay high fees or go without. Many cannot afford these fees and thus have no education or are taken advantage of by fly by night schools trying to make a quick profit off desperate migrants. One school though is attempting to bridge this gap by providing quality education to migrant children either at no cost or at a low cost. It is called the Beijing Dandelion School and it is run by idealistic and dedicated administrators and teachers who want to serve these migrant children. The school is an impressive place, though spartan, and I was impressed with the teaching we observed this afternoon. Teachers work for less than a tenth of what they could make in Beijing proper, yet they stay because they love the children and believe in what they are doing. The kids are extremely motivated and well-behaved, grateful for the opportunity they have. 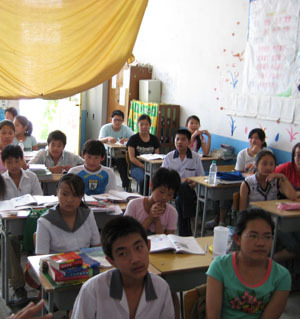 Several American schools have visited the Dandelion school to do community service in China. I would love to bring PDS kids here!